As I drove home from seeing my family on Christmas Day I listened to the Queen’s Christmas message on the radio. Amongst the themes of aspiration, inspiration and volunteering, a single phrase stood out to me. Her Majesty was quoting Mother Teresa when she said: “Not all of us can do great things. But we can do small things with great love”. As the speech concluded, I kept repeating those words in my head and mulled them over until I arrived home and got cracking with the dinner. Hours later, music legend George Michael was dead. It might seem there is little to connect the Queen’s Christmas message and the latest victim of 2016’s rampaging cull of everyone who was anyone during my youth, but stick with me. The morning after George Michael’s death social media was awash with messages of sadness, tribute and tales of what his music meant to people. Of greater interest to me were the many stories of his kindness, generosity, and support for charities and individuals. If you have followed the story you’ll no doubt have seen the above tale or will have read about the £5,000 ‘tip’ he left for a barmaid/student nurse who was struggling with debt (Buzzfeed has a great little rundown of these and similar stories). He was a major donor to charities and even found time to volunteer, in person. For a man with an estimated wealth of £105 million these gifts were perhaps, to him at least, quite small. It’s all relative, I suppose. But imagine the impact. Imagine finally having the chance to start a family, when you previously thought it impossible. Just think about having the weight of debt lifted from your shoulders. It’s life-changing stuff. To use the words delivered by the Queen on Christmas day, these were small things done with great love. Whichever way you voted in the EU referendum, there’s no denying we live in uncertain times. This uncertainty is fuelled by endless vague stories in the media of things that could happen, might happen, and various ‘what if…?’ scenarios. Throw in the Trump effect and you have a heady mix of unknowns. At times, it’s quite overwhelming. It’s easy to feel small in the face of huge challenges, frustrated that you can’t make a difference. Most of us aren’t in a position to give large sums of money away. Many of us want to do ‘something’ but are short on time and haven’t a clue where to start. The issues seem so big; too big for us to make an impact on. But what if we were to think small? What if we all thought about the small things we can do with great love? Whose world could you change? Who, in your local community, could you help? This might be anyone from a lonely neighbour, who you call in and have a cuppa with, through to a community group looking for regular volunteers. If we all did this, imagine the ripple effect? 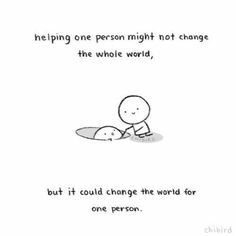 Call me idealistic but we can do something, we can make a difference, in a small way and with love. Volunteering Matters – Volunteering Matters focuses on the needs of four distinct communities; young people, disabled people, older and retired people and vulnerable families. There are programmes to suit you no matter whether you can give a few hours a month or want a full-time opportunity. Student Hubs – encourage students to take part in social action projects and gain valuable life skills. Team London – Team London is the Mayor of London’s programme for volunteering and social action in the capital. Really lovely, life affirming blog. Thank you!